Puppies that bite and nip at people and other dogs are exhibiting a very common and very natural behavior. They use their mouths to investigate all manner of objects, which is one of the reasons that they chew on things. The puppies are also going through a teething period. When they are first starting out engaging in this behavior, it can actually seem rather cute because they are so small. However, this “cuteness” is going to quickly vanish and turn to annoyance and then actual pain. The puppies have sharp little teeth, and they don’t always know how hard they are biting. This can cause pain and even draw blood. Puppies tend not to be very discriminating when it comes to who they are biting either. They will bite you, other adults, kids, and other animals. They think they are playing, but as they get older, bigger, and stronger, this behavior is going to become a massive problem. Therefore, you will want to start taking some steps right now that will help you to eliminate the problem. Bite inhibition is the ability of a dog to control their mouthing. Puppies, and those dogs who have not learned how to control this behavior, do not realize just how sensitive humans can be. This causes them to bite down too hard when they are playing. Generally, a puppy is going to learn bite inhibition when they are playing with other puppies. When they bite another puppy too hard, the puppy yips and stops playing for a bit, and the biter knows that they need to settle down. Because puppies like to play, this eventually leads them to learn how to control their bites, so they don’t have to stop playing. 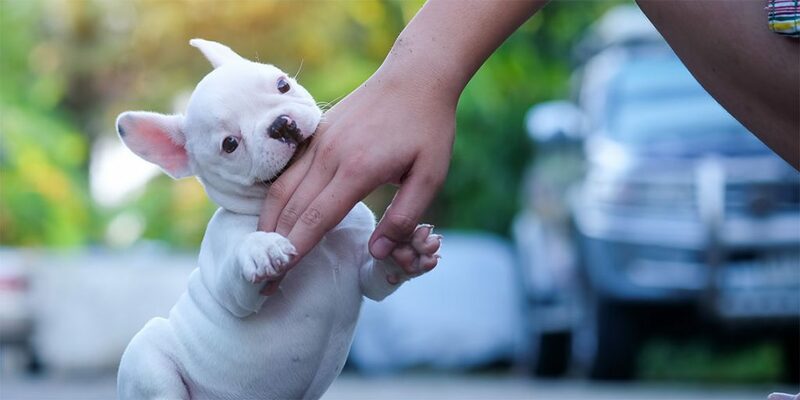 It is possible to use the same technique as a human to teach the puppy bite inhibition. When you are playing with the puppy, if she bites your hand too hard, let the hand go limp and say “Ow!”. Then stop playing and ignore the puppy for about 10 to 20 seconds. If the puppy keeps on biting and being rough more than three times in the course of about 15 minutes, you will want to put the puppy in their crate for a bit. The goal is to teach them that they need to be careful when they are playing and mouthing. You want to show the puppy that they should never put their mouth on you. A good way to do that is through redirection. When they attempt to mouth your hand or arm, you will want to pull it away before any contact is made. Then you will provide them with a chew toy, or perhaps a treat. This will redirect their behavior to something they are allowed to bite and chew on. Distraction and redirection can work well in many situations. You will find that there are many puppies out there that like to nip at the ankles of people when they walk. This is annoying and it can cause pain. While any breed might attempt to nip at the ankles, you will find that those who are part of one of the herding breeds tend to do it more often. If your puppy does this, you will want to stop moving, pull out a toy, and distract her until she starts to play with it. Nipping and mouthing might be natural behaviors, but they can be adjusted so that the puppies do not become a danger to other pets or to people. The sooner you start the mouthing training the better.